Product Review: Oven Gauntlets! | I Wanna Bake! Since college, I’ve been complaining to everyone who will listen that oven mitts need to be longer. I’m always doing several things at once when I’m baking, so I inevitably end up with a small burn on one forearm or the other at least once a year. Sure, I could pay a little more attention when I’m sticking my arms inside a 400° oven, but who’s got time for that? I’d prefer to have suitable protection, preferably up to my shoulders (perhaps even a cooking jumpsuit, which sounds like a good idea until you realize that you’re wearing an insulated jumpsuit in the same room as said 400° oven). My inspiration for these proposed extended oven mitts was welding gauntlets, which are long, leather gloves which protect your arms during welding. When I saw something that looked exactly like my dad’s welding gloves on the clearance rack at Sur la Table, I did a double take. I’d never seen anything like that sold in any kitchen section, and believe me, I’d looked. After some wishy washiness over the price (twenty whole dollars), I finally decided that these were something I needed in my life. Now that I’ve had some time to test them out, I’d like to share my new-found knowledge with you. These Steven Raichlen extra long barbecue gloves measure 18″ long and are made of suede. They are comfortable on my smallish hands with some extra room, so they should be able to accommodate average- to large-sized hands, but probably not bear paws (sorry, werebears). They reach approximately to my elbows. 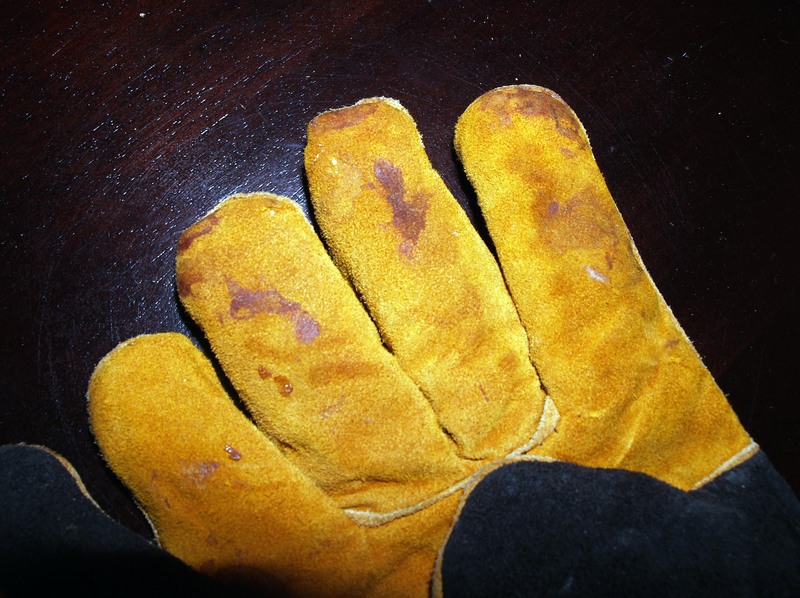 Based on my aforementioned experience with my dad’s welding gloves, these are constructed similarly to those, with a double-thick or lined layer of suede on the hands and a single layer of suede on the arms. The material is supple and requires no breaking in period. Furthermore, the fact that they have individual fingers gives you increased dexterity over the standard mitten design of an oven mitt. I have no complaints about the coverage of these gloves. Length-wise, they are exactly what I was imagining (let’s face it, shoulder-length oven mitts would just be ridiculous). Since I’ve started using these, I’ve had no problems with unfortunate oven contact to my forearms. For that alone, the $20 was worth it. That said, I do find two problems with these gloves. First, you might notice that I’ve been calling these gloves and not oven mitts. Aside from the fact that they have fingers, this is because they aren’t insulated the same as oven mitts. Because of this, they make it difficult to hold onto hot objects for longer than 30 seconds without feeling the heat. If you hold a hot pan much longer than that, the heat starts to become unbearable and you have to put it down to avoid a burn. Worse still, the suede retains the heat, so once you put your hot pan down, you’ll need to take off the gloves for a bit to avoid prolonged exposure. The second problem is that the suede stains easily and does not clean well. For me, this is just a minor annoyance, but if you’re the kind of person who requires pristine cleanliness of all things, these might not be for you. To be fair, these gloves were not designed for use as oven mitts. Instead, they were designed as barbecue gloves. It makes sense that their main purpose would be to protect your arms from the intense heat of a barbecue and occasional stray ember, with the added ability to adjust the grate quickly after it’s already been heated. In summary, I love the length of these gloves, but I do wish they were better insulated. That’s not really any fault of the manufacturer, given that these weren’t really designed to be oven mitts, but if they were to make the same thing but thicker, I’d run right out and buy them. Just sayin’. Please note that I paid for this product with my own money and did not receive any compensation from the manufacturer for this review, nor am I affiliated with them in any way. I simply wanted to try these gloves to satisfy my own curiosity and to share my results with other curious bakers.